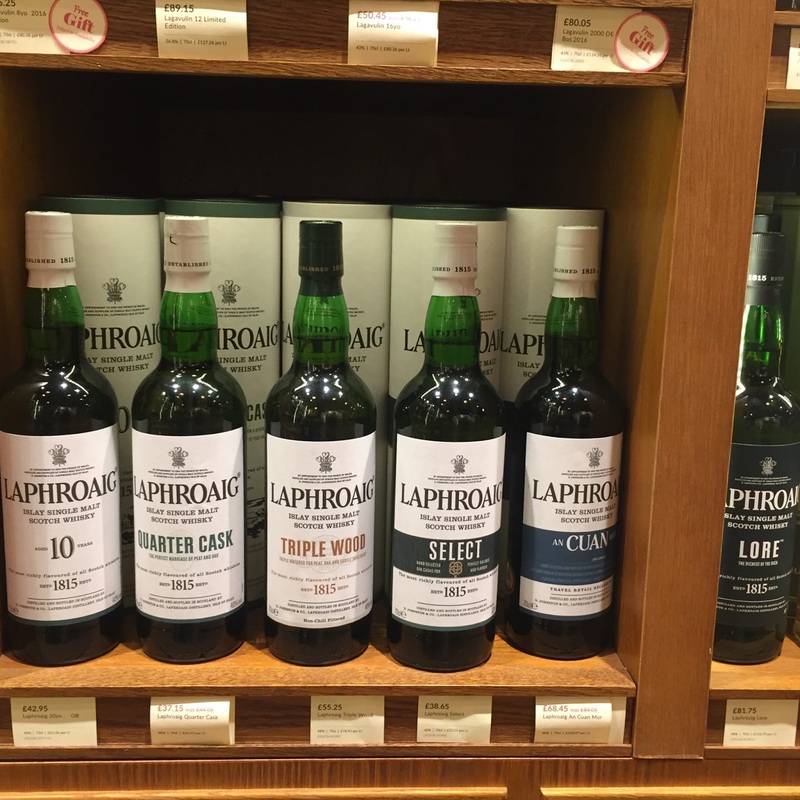 Whisky-honeymoon PART 1 – visiting Laphroaig Distillery! Dear friends and followers alike! I’m back from my summer vacation and a little time off from blogging. As some of you might remember me and my wife got married last fall. But why am I telling you this? 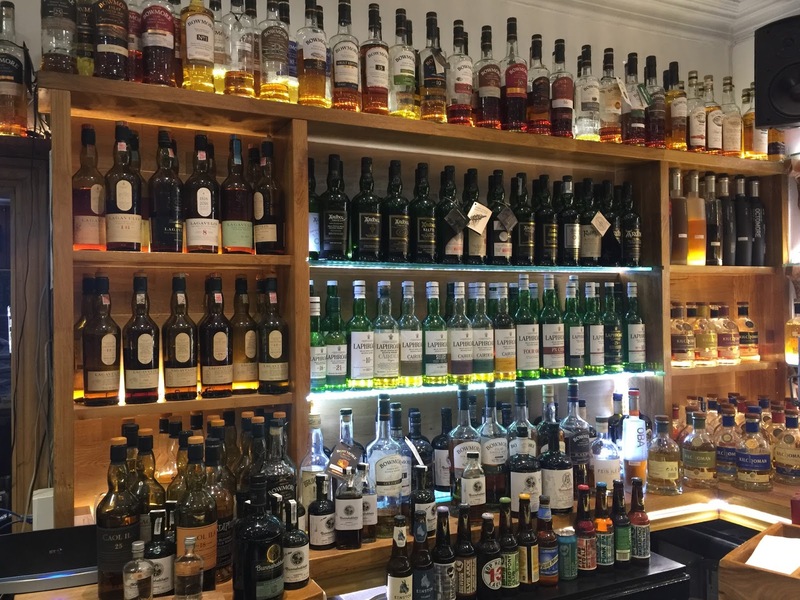 Because we started our summer vacation with a little honeymoon, a ten days trip to UK and Scotland that of course entailed some really nice whisky-related adventures which I’ll share with you in a three part picture-driven blog-post! Today I bring you PART 1 in which I’ll tell you about our visit to Laphroaig Distillery. In PART 2 I’ll tell you about our visit to Bowmore Distillery and PART 3 will be about my attendance at a Highland Park tasting during Rebusfest. As you all know by now, on the side of my regular job, I work the Swedish whisky festivals for Edrington, taking care of whiskies such as Laphroaig, Bowmore and Highland Park. 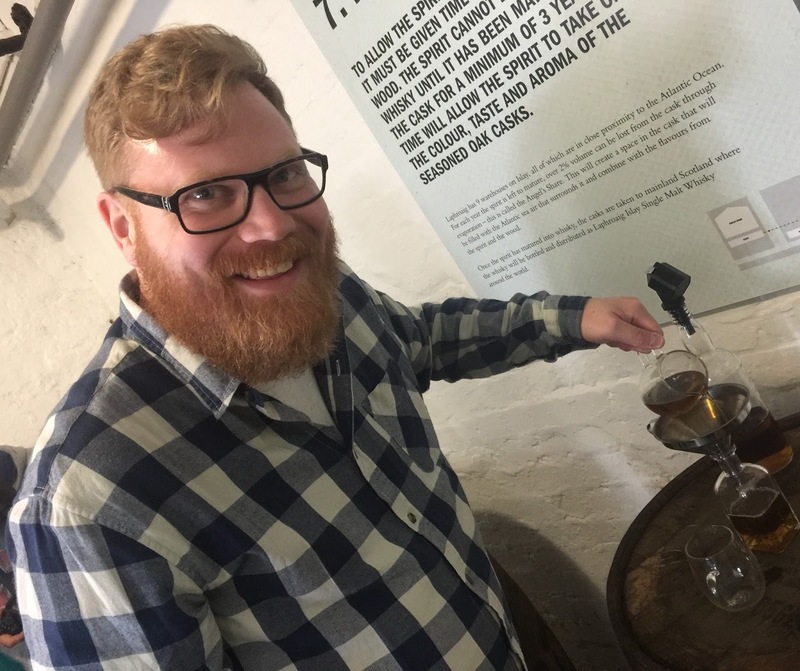 (As you might remember I was very fortunate to visit Highland Park last summer, please read all about it here). 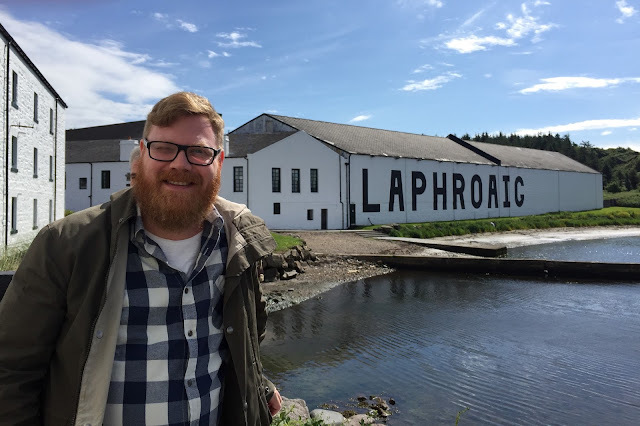 So for our honeymoon I really wanted to get more in-depth knowledge and learn more about some of the distilleries that are in the Edrington portfolio and at the same time make a dream come true: to first and foremost visit Laphroaig and secondly to visit Bowmore. Laphroaig Cask Strength “Green Stripe” was the whisky that around 15 years ago opened my eyes (and nose, and taste buds) to the wonderful world of whisky and ever since then Laphroaig has been on my dream-distillery-to-visit-bucketlist for a looong time. And hey, while on Islay, why not visit Bowmore as well?!. So, since I for a number of times during the festivals here in Sweden have been very fortunate to work alongside my good friends and colleagues Vicky Stevens (the Visitor Centre Manager at Laphroaig) and Joakim Liljeqvist (the Swedish brand ambassador for Beam Suntory Single Malts) I contacted the both of them to hear if they could set up visits to Laphroaig and Bowmore. And they were both very, very helpful indeed. After having a nice evening dinner in Glasgow I did some emailing with Vicky to settle some of the final details of the visit to Islay. 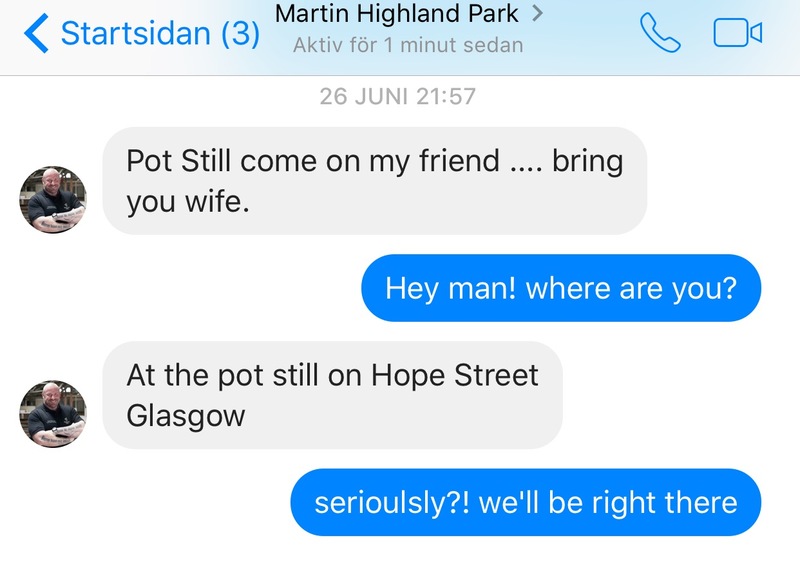 Later that evening, out of the blue, I suddenly got a message from Martin Markvardsen (Senior Brand Ambassador at Highland Park)! It turned out that Martin accidentally was in Glasgow due to some travel-trouble. 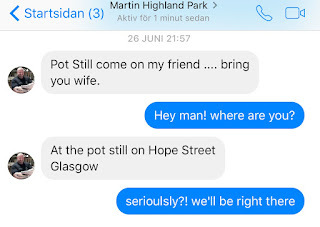 A couple of minutes later I noticed that I also had received an email from Vicky saying: “I’m in the Pot Still Bar with Martin Markvardsen if you want to join“. So, it turned out she was incidentally also in Glasgow, what an unexpected but extremely pleasant coincidence! Of course me and my wife headed to the bar to meet them, it was also very nice to introduce my wife to my colleagues and vice versa, and we were happy to join them for a couple of beers and some whisky. Craig explained to us that the barley is first soaked with water, on three separate occasions (together lasting for 51 hours). After soaking it is spread out on the malting floors where it, depending on time of year and temperature, germinates for around six days. The malted barley is turned every fourth hour 24/7. Before moving on to the Peat kilns, Craig opened the door to the floor (or maybe “roof”) above the kilns, what a beautiful sight! Now that is some serious peat smoke! We then moved on to one of the two Peat kilns. According to Craig the peat they use is handcut. He also mentions that Laphroaig is the only distillery on Islay to handcut their peat. Between April and September they cut around 200-250 tons of peat. The peat is then left to air-dry for three months before being used in the kilns. The two kilns are not used simultaneously but rather one kiln at the time (every other day). According to Craig the barley is peated/smoked for 15 hours. 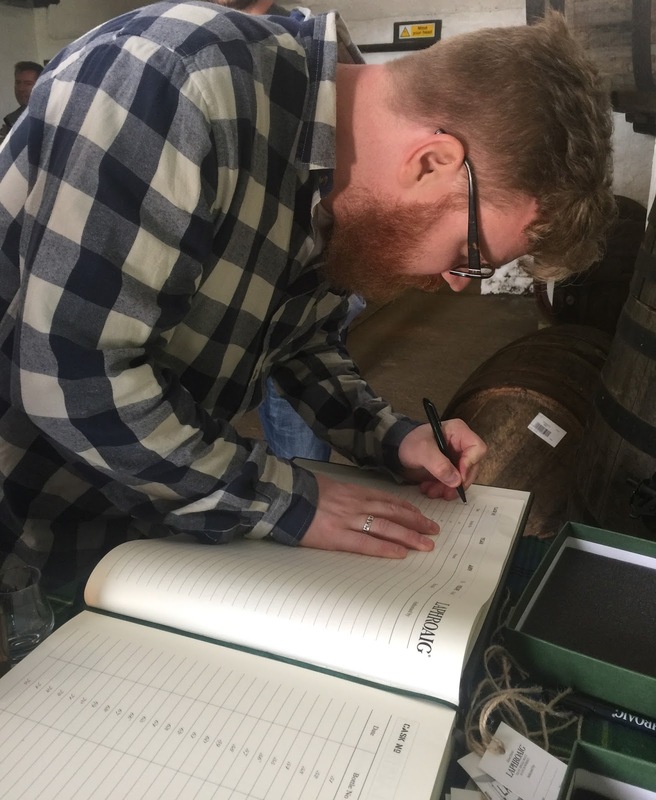 (In the book 200 years of Laphroaig by van Gils & Offringa it is however stated on one occasion that the peating goes on for 17 hours and on another occasion that it goes on for 14-16 hours, so lets stay safe and say that it goes on for between 14-17 hours). While visiting the Kiln I was very lucky to be allowed to throw some peat in the Kiln, yay! 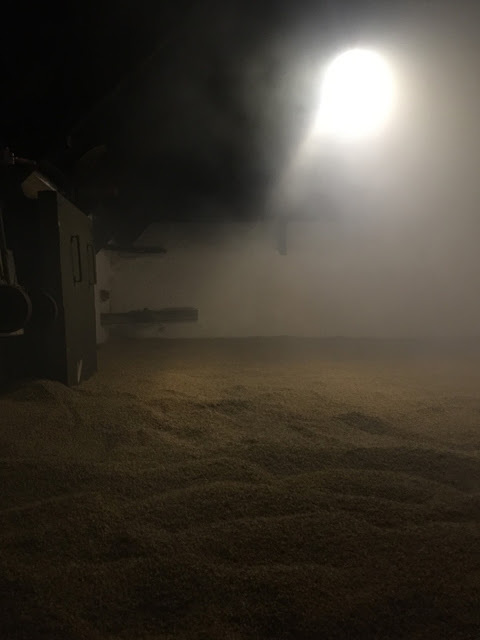 Craig tells us that when the peating/smoking is done the peated barley is air-dried for 10 hours. (17-20 hours according to van Gils & Offringa). Craig also tells us that the ppm they aim for in the part that they peat/smoke on site at the distillery is minimum 50ppm. (In this interview, Laphroaigs master distiller/distillery manager John Campbell, says that the part they peat/smoke at the distillery ends up at around 60ppm. In the book by van Gils & Offringa, Laphroaigs Maltman Arthur Holyoake states that the barely they peat/smoke at the distillery holds 35-65ppm). Craig also tells us that when their own part is mixed/put together with the part that comes from PEM (35-45ppm) it ends up at 50ppm. This seems reasonable considering that their own part occasionally is/can be as low as 35ppm but (let us assume) most of the time is at a minimum of 50ppm and at a maximum of 65ppm. Anyways, we then moved on to the room with the Lauter/Mash tun and the six stainless steel wahsbacks/”fermenting vessels”. Each washback contains 52800 litres. The yeast (Mauri) that is being used at Laphroaig is of a liquid kind. They end up with a wash-beer holding 8-8,5% ABV. OMG what wonderful scents we smelled in there. The Stillhouse holds seven stills; four spirit-stills and three wash-stills. The wash-stills (no.5-7) holds 10400 litres each. The Low-wine/wash comes out of the stills holding 22-25% ABV. We were very lucky to stick a finger into the flowing wash to taste it and it was sooo mellow but at the same time so incredibly peaty! The "foreshot" is 72% ABV. The "heart" comes out of the spirit-stills ranging from 60-70% ABV (although 70-60% ABV should be a more accurate way to put it). The new make ends up at 68% ABV. SamuelWhisky at the great wall! YAY, put my flag on my plot! This is where the new make, after being diluted with water, is filled into cask at a strength of 63,5% ABV. As you all understand it was simply amazing to pay Laphroaig Distillery a visit, both since it’s one of my absolute favourite whiskies and since I know am “a bit” more knowledgeable about the production process. Something that will definitely come in handy when working the upcoming festivals for Edrington ☺ So, the biggest thanks of all to both Vicky and Joakim who made it all possible, Sláinte! 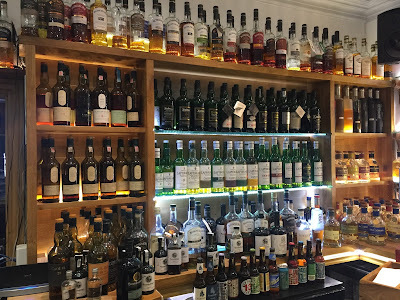 Please do pay my blog a visit in a couple of days to read PART 2 in which I’ll tell you about our visit to Bowmore Distillery!